While agate is not a traditional birthstone, it is a favorite of man witches and often amulets and talismans made to ward off dangers are made with agate. Witches often use black agate for protection, to restore energy within the body and to relieve stress. The agate amulet such as the one shown here is quite rare – this one was listed on Ebay for $1,500. If you love crystals you might want to look for a beautiful agate. Agate has a number of wonderful properties. Agates most noticeable properties overall are balancing yin/yang energy, courage, protection, healing, and calming. Agate promotes stability, composure and maturity. These warm and protective properties will help your self-confidence as well as your own security. If you have insomnia consider placing an agate near your bedside to promote pleasant dreams. 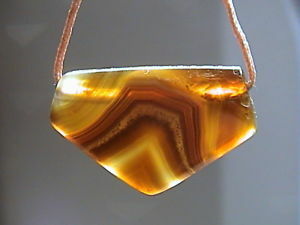 Agate has been known to help mothers avoid getting the baby blues when pregnant or caring for an infant or young child. Wearing an agate jewel necklace also is known to mentally encourage lactation because it relaxes you. Wearing an agate necklace will help you stay calm and promote emotional harmony. Agate is a great stone to keep for keeping calm and getting back to the basics. It helps you be happy in the here and now, and quenches those burning desires for things that you really don’t need. Agate will keep your stress down when juggling too many commitments or jobs. Lastly, agate can help promote marital stability.